When you look at stovetops or cookers, you will often see the phrase induction referring to the method by which the heat is generated. But what does induction mean and what are the benefits it can offer you? An induction cooker uses an electromagnetic field to heat the pan while at the same time, the cooking surface remains cool to the touch and there is no residual heat built up that radiates out into the kitchen. This means it is safer and more efficient than either gas or electric cooking. Being that the pan is heated by this magnetic field, as opposed to the normal way of heating just the bottom of the pan with a flame or electric, less heat is wasted. This is because the air around the pan doesn’t get heated up. In a gas stove, only around 40% of the generated heat ends up on the food for cooking, the rest is wasted mostly in making the kitchen hotter. Electric ranges are a little better, at 50% used and 50% wasted. Induction ranges are a huge 90% efficient, meaning only 10% of the energy generated goes for other purposes. Because the surface doesn’t get hot when you are heating up a pan, you can actually touch the stovetop and don’t get burnt. While this isn’t something most people would experiment with, it also means that if something spills from the pan to the surface, it won’t burn on. This makes clean-up easier and won’t fill the kitchen with the smell of burnt food. Compared to gas or electric, induction tops also heat up a lot quicker, which also saves energy. A 12,000 BTU gas burner will take 36 minutes to boil up five gallons of water but an 1800-watt induction hob will need only 22 minutes for the same job. A watt is equal to 3.4 BTU’s so even in absolute terms, induction is still the quicker option. 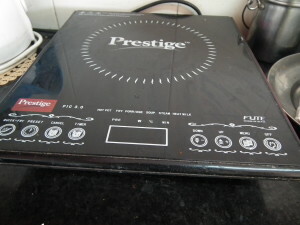 Induction cookers also respond with greater speed when you change the temperature you need them to cook at in a similar manner to gas cookers. You turn it down and it instantly gets cooler meaning less chance of accidental burning because the pan is still too hot. The only downside with induction stovetops is that you can’t use all the types of cookware with them. You can only use induction cookware made with ferrous metals such as steel or cast iron so aluminium is a no-go, so is glass or ceramic. The way to test if your cookware is compatible is simple; is a magnet sticks to it you can use it on an induction top. Induction cookers come in countertop models that are free-standing and have one or two hobs to cook on. Most of them have safety features built in so that if there isn’t a pan on the hob, it automatically switches off. You can also get drop-in models that you can incorporate into nearly any kitchen.